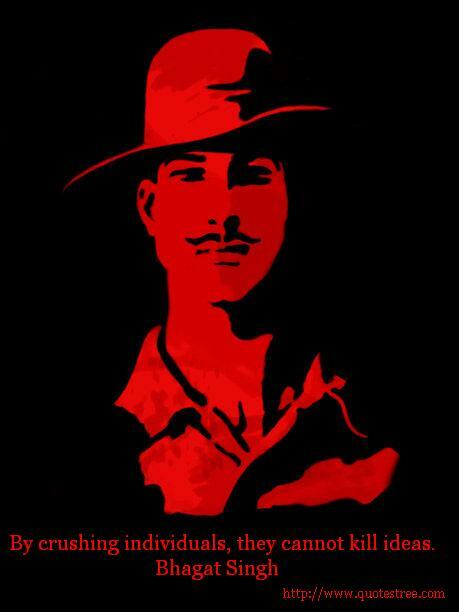 Bhagat Singh was an Indian freedom fighter, and considered to be one of the most influential revoltunaries. Here I have compiled down some of the inspirational Bhagat Singh quotes and sayings. Just hope you like the quote compilation and learn something inspirational from the words of great Bhagat Singh. Every tiny molecule of Ash is in motion with my heat, I am such a Lunatic that I am free even in Jail. Non-violence is backed by the theory of soul-force in which suffering is courted in the hope of ultimately winning over the opponent. One should not interpret the word “Revolution” in its literal sense. Various meanings and significances are attributed to this word, according to the interests of those who use or misuse it. We have already very many such leaders who spare some evening hours for delivering speeches. They are useless. We require ? to use the term so dear to Lenin ? the “professional revolutionaries”. The whole-time workers who have no other ambitions or life-work except the revolution.